Now that I’ve finished my epic upload saga, I’ve added more detail about the gear we used to shoot Natural Victims. It’s certainly not the perfect kit, but it was relatively cheap and, on balance, very effective. I’m pretty certain there’s no other feature-length movie out there that was shot with the stealthy LX-3. Hope this inspires you to build your own guerrilla shooting kit. 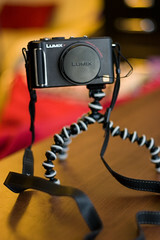 Let’s start with the hero of Natural Victims, the Panasonic DMC-LX3 ($509.83). I adapted it with numerous accessories, but first of all, let’s talk about the basic camera. This camera is so sneaky, we were once approached by a guy who was standing feet away from it and didn’t see it. No one ever suspected we were shooting a movie with it — it just doesn’t look impressive enough. But the specs of the camera are super-impressive. It has a fast, if tiny, Leica lens. The LX3 shoots 24p HD video with auto-focus and auto-exposure – and it can’t zoom while you’re shooting. On one hand, these are definitely creative drawbacks. On the other hand, it meant I didn’t need an AC. You can fit more than an hour of HD video on a 16GB SD card. I had two Transcend 16 GB SDHC Class 6 Flash Memory Cards ($36.98 each) and two Kingston 4 GB SDHC Class 4 Flash Memory Cards ($10.95 each) and I never ran out of storage, even when we shot all day. The only drawback to shooting with these cards is that they are so tiny. We were careful to put spent cards in plastic cases and the cases in a larger case inside the kit bag. As far as batteries go, the LX-3 was a workhorse as well. I bought three extra batteries, all non-OEM Kinamax BTR-CGAS005-J 1500mAh CGA-S005/NP-70 ($16.99 each). There have been rumors that Panasonic was updating their firmware to make non-OEM batteries stop working. If you buy the Panasonic brand batteries, they are $47.21. Not an option when you need a bunch. The Kinamax never gave me any problems, and we put them through their paces. I only ever used two full batteries in a given day, and I wasn’t that careful about conserving energy. Still, I got an extra charger that could also be plugged into a car, just in case. I actually liked the Blue Nook Panasonic Lumix DMC-LX1, DMC-LX2, DMC-LX3 – Replacement Battery Charger (Incl. Car and European Plug Adapters) ($5.90 + shipping) better than the charger that came with the LX3. The LX3 charger has a green light that goes off when a battery is charged. The Blue Nook charger’s light goes from red to green – much more logical. To adapt filters and lenses to the LX3, I got a Bower Lens Adapter for Panasonic Lumix DMC-LX3 ($12.99 + shipping, 45.5mm to 52mm). Actually, I got the adapter with my Opteka .45x HD² Wide Angle Lens ($29.95 + shipping). This is a steal of a deal, because the wide-angle lens is great for the price and you get the adapter. The Opteka .45 wide angle lens accepts 77mm filters, and you see it here with a Tiffen 77mm Circular Polarizer ($49.95). I confess that, while I had plans to use the wide-angle lens in the movie, I didn’t ever pull it out. The LX3’s widest setting was plenty wide, and it takes time to change lenses on and off. All of the lenses and filters are screw-on, plus when you’re out on dusty trails you have to spend time cleaning every glass surface that touches the air. Trivial with a dedicated AC, but time-consuming when you’re the DP, camera op, AC, director and sometimes actor. The other lens I got was a Sony VCL-DH1758 Tele Conversion Lens ($106.14). With the Bower adapter, this lens has a hard vignette, which makes it look (in the LX3’s 16:9 mode) like you’re shooting out of a porthole. This can be eliminated by zooming in on the LX3 so the LX3 lens is drawn back and just holding the lens flush with the camera. I couldn’t do that and operate with any kind of confidence, however, and I never found an adapter ring solution that would hold the Sony lens close enough to the LX3 (for which I blame Panasonic, since the 45.5mm ring size is just shy of a standard 46mm. This Sony tele lens also doesn’t accept filters in front of the lens and it has some color-fringing issues. I shot some killer-p.o.v. shots with it, but ultimately didn’t use them because, to get rid of the vignette, I would’ve had to crop in to the point where the color fringing and loss of sharpness is apparent. Filters were a key part of how I made what looks good in Natural Victims look good. Since we were constantly shooting in bright, direct sunlight, the Tiffen 58mm Neutral Density 0.6 Filter ($15.67) was almost always on the camera. ND filters and help mechanically reduce exposure, which can narrow depth of field, and reduce contrast. (There are some shots in the movie where there is still too much contrast, but part of the reason for that is because I ran out of time to do a color correction pass.) The other main filter which was almost always on was a HOYA 58mm Circular Polarized Filter ($40.35) which I already owned for use with my DSLR, but rarely used before. That changed on this movie. What the polarizer does is reduce reflections and make the sky bluer and the vegetation greener. If you use it right. Most of the time I remembered to turn the filter until it optimized the green of the trees or the blue of the sky. In direct sunlight, this was very difficult to see on the LX3 viewfinder, which gets pretty washed out, but I got decent at it by then end of the shoot. Even when I forgot to turn the filter, or when I was doing a shot where the camera’s angle to the sun changed (and therefore the polarization of the light), I think it still helped reduce the total amount of light hitting the LX3 lens. One thing – when the camera was pointed in such a way that sunlight was hitting it directly, you can see reflected in the filters the lettering on the LX3 lens. I didn’t notice this at the time of shooting, and I don’t think most people notice it when they see the shots in the movie, but if I had known it was going on, I would’ve taken a sharpie or some gaffe tape and blacked out the lettering, or just changed the angle of the shot. To adapt these 58mm filters from the 52mm Bower adapter, I got a Fotodiox 7 Metal Step Up Ring Set, Anodized Black Metal 49-52mm, 52-55mm, 55-58mm, 58-62mm, 62-67mm, 67-72mm, 72-77mm ($13.99 + shipping). These are great just to have, because it frees you in the sizes of filters you buy. I was able to buy sizes that will also be useful for my SLR lenses, as well as being useful with this LX3 kit. To protect everything, I also got some lens cap covers in the same sizes as the filters, knowing sometimes I’d want to walk around (or hike) with them still attached to the camera. The Fotodiox Inner pinch Lens Cap with Cap Keeper, 58mm ($1.95 + shipping) was one I used constantly. For supports, I had three guerilla-shooting-friendly options. The first is a Tabletop Tripod with Ball Head ($16.54) which I used for the steady indoor shots that you see of me speaking directly to camera. The second is the Joby GP1-E1EN Gorillapod Flexible Tripod (Grey) ($18.95) which is great for shooting in nature, because you can wrap it around a tree branch, or your monopod. Speaking of monopods, this was the support of choice. I kept the camera attached to it most of the shoot, and even when I was going handheld I used it to help balance my movements, by dropping it down just above the ground so that the center of gravity for the rig was moved lower. This was also part of my DSLR kit, so I didn’t buy it specifically for the movie, but you can find a comparable used one for about $20, or you can get a Manfrotto one included free with this bundle: Kata-Manfrotto KT DR-465-MP Digital Rucksack Promotional Bundle with Free Manfrotto 790B Modo Monopod($74.95 + shipping). Speaking of the rucksack, believe it or not every single thing described above and more fit comfortably in my Kata KT DR-467-BR Digital Rucksack $79.90). This is an amazing bag, which I found out about by listening to recommendations on This Week in Photography podcast, and by Googling around. It’s designed specifically with cameras in mind, with cushioned compartments for lenses, zip pockets for filters, and even a rain cover. There’s even a place for a water bottle and straps I was able to tuck the monopod into. It was great for all the hiking that the shoot required — and didn’t give me back pain like hiking with the Portabrace sound kit did. We put this bag through its paces and it still looks brand new. We rented Sound Devices 744T digital recorder with Lectrosonics wireless setups and Tram TR50 lav mics. Total cost: ~$750 for 11 days rental from a major sound equipment place. From people who know nothing about sound, I’ve gotten some very nice comments on the dialogue recording. It would certainly sound much better if we had had time to mix it. I hear a lot of problems, all but one of which would have been eliminated if we had people running sound who had more experience. (Sound guys ain’t free for good reason.) The one issue that I’m fairly certain we would’ve had no matter what is that at the top of some peaks we got crazy interference on the Lectrosonics UM400 Transmitter / UCR411 Receivers. This was a real pain-and-a-half. I ponied up for the Lectros because they are supposed to be the best, and because I knew we couldn’t shoot guerrilla style with a big ole boom mic. I know LA is a hotbed of interference issues, but it really kills a production when you’ve hiked for an hour to get to a location and you can’t use the location because of wireless interference. Most of the kit was powered by an awesome power distribution system, which ran everything but the wireless transmitters all day on one big battery. The rental tech said the 9V batteries in the wireless transmitters would only last 2 hours each. Based on this info, we bought way more 9V batteries than we ended up needing. If you’re based in LA and want a good price on a stack of 9V batteries, give me a shout. For the rest of the expendables kit, we had moleskin to reduce clothing noise which we never used — but probably should have! — and medical tape to affix the mics right to the guys’ chests. We used a vampire clip into the bra for Amy’s mic. The medical tape did fail once, on me, when I attached it to an already sweaty chest, then ran around in that heavy hoody that you see. The mic fell down and we didn’t even realize — we actually did get sound but the levels were low. That’s one of the reasons my big final monologue didn’t make the cut. The other major outlay for the movie was in getting some storage. I wanted to be able to backup my footage redundantly, but not deal with all the hassle and expense of RAID arrays. Enter Drobo, the data robot. Drobos automatically configure themselves to maximize storage and redundancy, and you can expand them while they are in use. I filled two of the slots with Western Digital 1 TB Caviar Green Hard Drives ($89.17 each) and that gave me 1TB protected storage with two empty slots for future expansion. I like my Drobo, officially a 4-Bay USB 2.0/FireWire 800 SATA Storage Array DR04DD10 model ($395.95), but I made the mistake of trying to move it. You’re supposed to wait for it to go into standby mode before unplugging it. I couldn’t get it to do so. Then, when I took it into the office to dump files, it said the footage was no longer protected. It was still there, mind you, but Drobo was acting like it only had one drive, not two. I rebuilt it at the office (while importing the footage), then had the same standby issue. I took it home, rebuilt it again, and when I needed to transport footage to the office the next time, I just used an old Maxtor 250 GB External Hard Drive ($65) I had sitting around. That one, at least, didn’t mind being moved! Natural Victims: Edit is Done! #2wkfilm Completed in Time! Natural Victims: Watch it Now! i came to your blog to find out what rig you used to do those sick pans in your movie, but all you wrote about was batteries and mics! what was the handheld rig? where'd you rent your sound gear from, coffey sound i hope..
i watched this on a slow internet connection in poland, and i didn't realize you had me by the balls until the movie froze at 56:36, and i had to wait an hour before i could finish it. by the way, all those cuts (around that timecode) were really sick. also earlier when it cuts from one empty landscape shot to another empty landscape shot was ill.
i guess my biggest gripe at the end was that the shot of the plaque didnt last long enough to read it, and i dont even think i could read brundige's credit, or any of the credits, except the special thanks, i guess you were just trying to make the credits fit in with lillians ending track, but it made me feel nervous and stressed trying to read it all instead of chilled out at the end of a fun movie..
awesome job, you had me by the balls.